The traveler’s mind is never at rest. Always on the move, always open to new experiences, it moves and floats through unexpected and undiscovered worlds. For the traveler, the journey is a form of research, a strategy to increase her/his knowledge: The movement and the shift within the cultural, physical and symbolic space are two basic coordinates of the travelers acting and serve as a form of seeing, intended to initiate a multi-sensorial practice. Through this form of seeing, the traveler takes possession of space and through new processes of abstraction and representation, the experience of unknown places (and cultures) become a symbolic, individual and collective capital. The comparison with what is thought of as ‘new’, functions as a mirror that initiates a comparison with one’s being. It activates the translation of the Self into action and practice which take on an individual and collective dimension by virtue of the interaction between different systems (social, political and economic ). Lastly, the journey is a way of delving into one’s own personality, a way of finding answers to questions of the self. Alex Yudzon travels not only for inspiration, but as an integral part of his creative process. The series “A Room For The Night” was born during a business trip to Basel in the summer of 2014. The series marks a turning point in Yudzon’s artistic practice, which up until that time had mostly focused on painting, drawing, sculpture and short breaks of street photography. 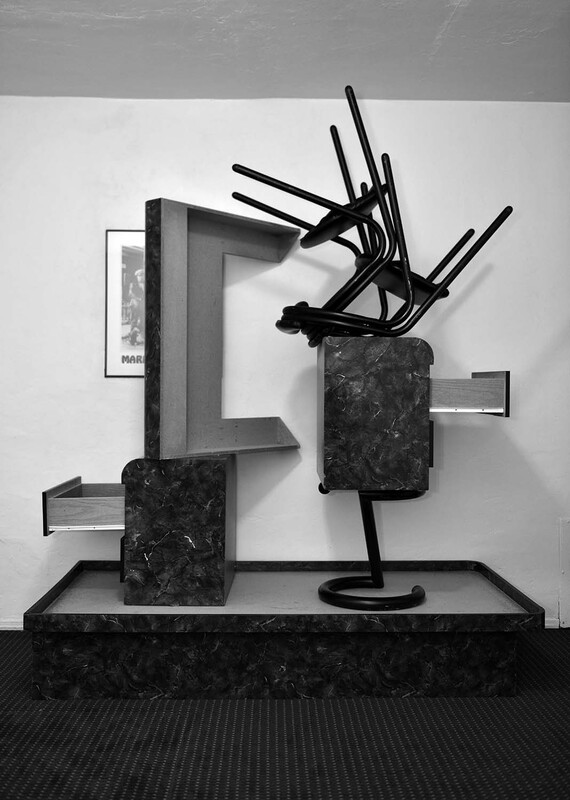 As a guest in a small hotel room in Basel, Yudzon began to interact with the decor of the room, using furniture as structural elements to create temporary site-specific sculptures. Suddenly his ongoing research on the meaning of home and identity took shape in a new body of work. Yudzon, who emigrated to the United States at the age of eight, began investigating these questions through painting, sculpture and collage and continues to do so with photography. The concepts of transformation and impermanence, home and location, places of origin and roots, are issues of great importance for Yudzon, and they continue to be in this photo series under a new aesthetic. The furniture in the rooms, originally just functional, suddenly awakens and turn into living sculptures. They interact with each other, they merge, they embrace and they love. They form new configurations, new constructs, far from functionality and loaded with something human. A wicker chair, turned up side down on an empty and lonely bed, ‘dressed’ with elegant shoes, looks almost mischievously to the pillow for someone. In another moment the same chair dovetails with another chair, a painting and a cabinet in the drawer of a higher chest of drawers. The legs of the smaller chair ’embrace’ the painting closely, as if they were afraid of seeing it run away. The same series also includes a picture of twenty-five hangers forming a rhombus, like a flock of flying ducks, who seem to ‘march’ towards the exit door. Yesterday’s simple contraptions to hang clothes now animated objects with another meaning. Yudzon, who initially captured in his lens interesting images and moments of everyday life in a passive way, now applies a more proactive approach, interacting actively with the surrounding environment. The subjects of his photographs are not just nice looking elements, but take on a new life. Starting with an almost Dadaist approach, where each single element is considered already a piece by itself, he then proceeds to act in a more Constructivist manner, building a sculpture, although temporary, and creating significance through formal composition. The constructs, absurd and ironic at the same time, speak of lust and desire, and a search for a feeling of being at home and of intimacy. Every hotel room is a new place, momentary yes, but also a site where the traveler must temporarily feel at home and inhabit it. The aspect of time plays a further important element as Yudzon’s ‘characters’ are destined to disappear after a while. Made in secret (the hotel room must obviously be back in order the next morning) they live only for a few hours and survive thanks only to their immortalization through the camera. Other trips, other works. New York, Miami, Washington, Wellington, New Hampsire, Roxbury, Cape Cod and more recently Rio De Janeiro. Yudzon continues to practice both sculpture and photography clandestinely in the rooms of the hotels and guest houses he stays in. Bookshelfs bend, drawers and seats raise themselves, beds and nightstands dialogue and assume a kind of human quality before returning to their places at sunrise. The search for identity that Yudzon engages in through this continuous analysis of these domestic yet previously unknown environments, transforms the Self into both action and an element of his artistic practice. 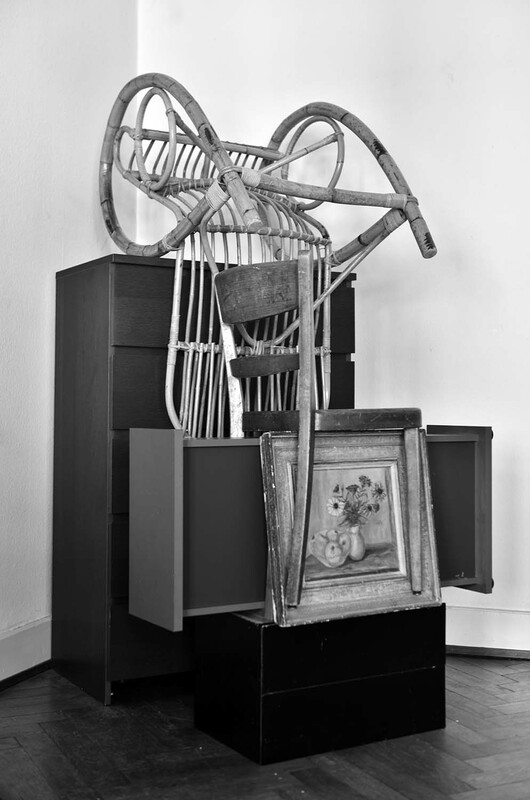 The series ‘A Room For The Night’ hides a dual and new aspect of sculpture making as the artist creates these works by approaching two different techniques and in two subsequent moments: First there is a real, physical sculpture, built manually with existing objects, and then there is a second sculpture that exists as an image in the photograph. The work, which can be contextualized between a totem and a monument, acquires through the camera not only a diverse materiality, but also a new meaning. It finds its true and definite identity in becoming a vehicle of history and emotions. Disappearing from its physical reality, the object / sculpture exists and develops its life in the image and becomes, thanks to the abstraction of the real meaning of its elements, a symbolic and collective capital, just like the journey that enriches the traveler’s mind. ‘The most important thing is not so much what people see looking to the work (or the show), but what they see after having seen it, as they face the reality in a different way’ said Gabriel Orozco in a conversation with HD Buchloh . And same here! The viewer can confront and investigate her/his own position in the world, in her/his home, within her/his objects and learns to see differently. The works by Alex Yudzon are shown in the exhibition ‘A Room For the Night’ at LABottega, Marina di Pietrasanta (I) from May 30 to July 19, 2015, and in Fall 2015 at sarahcrown New York.